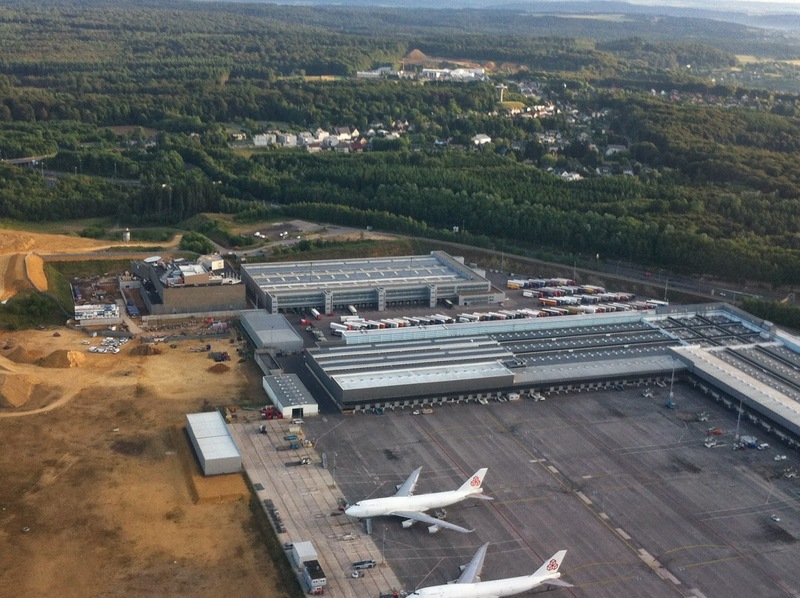 Press releases have revealed recently that the Luxembourg-based logistics corporation Cargolux, one of the major freight-only carriers in this business world-wide (currently Europe’s no. 1), has transported fresh cherries from Santiago, Chile, to Zhengzhou, China. The load of about 725 tons was divided across six aircraft shipments that were routed from Santiago, Chile via the Luxembourg Cargo-Centre at Findel airport, to Zhengzhou in the province of Henan, Central China. This trip stretches more than 20,000 km across the globe (ca. 12,000 km between South America and Western Europe, and another 8,000 from Europe to China). Zhengzhou was recently added to the Cargolux-network, after the Province took over a 35% share of the firm that was initially held by the Qatar government. Cargolux now plans to operate a sort of dual-hub concept between Western Europe and China, hoping to spark the ignition of regular business relations with mainland China. (According to the company’s PR department, coastal destinations such as Hong Kong have already been served by Cargolux since as early as 1970). The cherry-load is reported to generate a certain market potential for exporters and air-freight businesses, as more and more Chinese are getting accustomed to consuming fresh fruits from all over the world. According to another press release, about 50% of all Chilean exports are expedited to China. In this context, flying cherries to the other end of the world seems to be a proper indicator of the rising living standards in the Far East – a step closer towards global distributive justice, if you want. However, this phenomenon could also be discussed in terms of sustainability, where so called “freight miles” or “food miles”, respectively understood as the long distance supply of consumer goods and perishables such as produce, exotic vegetables, fruits etc., are suspicious of adding to the environmental burden of the modern, increasingly globalised consumer society. They also played a role in critical accounts of free trade agreements (Lang & Hine 1993, p.61). Two particular points come into play here. Firstly, freight miles and the international if not global division of labour have led to an emerging claim for a spatial reconfiguration of the economy. In the context of an increasing awareness of food security and sustainability, the associated new geography of food is expected to be a local and regional one. It is based on closed-circuit systems of supply and demand, thus borrowing from older ideas of self-sufficiency and regional autonomy (see Kohr 1976). In so doing, one aims to overcome the various externalities associated with the exchange of commodities at large scale. Food seems to be a central resource in this discourse, also indicated by the rising number of initiatives that promote organic food production, regional supply systems, or urban gardening. It is, however, all but clear that these regional systems can prove to be environmentally beneficiary in all cases (see e.g. Donald et al. 2010, and the special journal issues on this topic in CJERS 2010 or IPS 2009, and Winter’s progress reports on the geography of food systems in PiHG 2003-2005). Human geographers have already pointed at the essentialist notion of space that is conveyed in such imaginations, since it is rather unlikely that open systems may be effectively downsized to the regional or local scales (Born & Purcell 2006). This might be the case at least as long as today’s ubiquitous mobilities remain at work. Environmental analyses have also revealed that the greenhouse gas-emissions of major food chains are only partly a result of transport, and most are due to core production processes and related energy consumption (Weber & Matthews 2008). Furthermore, in some cases long-distance exports are the only possibility for developing countries to cultivate a presence in commodity markets, while replacing these products with local commodities and buying practices would reduce climate impacts in only limited extents (McGregor & Vorley 2007). Last but not least, there are certain “ecologies of scale” that have to be taken into account here; that is, the efficiency gains provided by the shipment of large consignments (e.g. in standard containers on ocean vessels) even at greater distances can have a positive impact on the environment – when compared to the less well organised local and regional distribution systems, which often lack a critical mass for efficient operations (Watkiss et al. 2005). The literature is vast here, and the degree of differentiation is, of course, rather high; so, on the one hand, one must be cautious. On the other hand, the common belief that local and regional cycles would always, and automatically, be better or more sustainable than large-scale systems of provision – can be questioned. Secondly, the changing attitude of consumers towards sustainability, in concert with associated forms of regulation, may threaten the business model of small states that often depend on circulation. As these micro-entities are too small to develop their own export basis, many of them have specialised in niche-economic activities, performing as enclave economic spaces, if you want. The Grand Duchy of Luxembourg is no exception here (Hesse 2014a). It seems to be a template case of wealth accumulation by circulation, a prototypical hub city or country – small but highly connected. As we all know, the related flows in the country’s portfolio are huge. They include, still most important, money and the associated services, in a range of activities which is much broader than it was recently revealed by the investigative press (if one looks at investment funds, insurances and the like, not only tax evasion). Yet, what flows is also information and high-tech communication; a broad variety of consumer goods, pharmaceuticals, and machinery carried by air freight; the mere cross-border sales of petrol and tobacco; and more recently, a certain range of highest-value commodities stored for the super wealthy in a protected, tax-free warehouse called Freeport. One could imagine that policy packages consisting of climate change and energy policy measures, tax harmonisation, or the claim for re-regionalisation of the economy can put a certain pressure on these commodity circuits and, thus, on hub cities. However, the still most important challenge for the related role of hubs is their economic rationale as such: How is the concrete demand for bundling material flows nested in certain places, so they can borrow size and significance, in order to capitalise on these processes? How can they survive in a rapidly changing, highly competitive environment, given the fact that markets are becoming increasingly integrated, and hubs can be moved away from one place and to another much easier than it was the case with the traditional transport gateways (see Hesse 2014b)? Finally, whether we like it or not, carrying cherries from Chile to China does provide economic benefits and, thus, contributes to a sort of social sustainability, given the number of jobs that are created at, or moved to, these hubs. This is even true when parts of these benefits tend to spread widely (see last year’s blog entry on ports and regional development). Logistics services can offer jobs in a range of qualifications that has almost disappeared, as a consequence of de-industrialisation. While this brings a certain temptation for regions to accept a sort of "dark side" of distribution, consisting of temp staffing, low salaries or problematic health conditions — reasons for which the labour conditions in warehouses of firms such as amazon.com and others were criticised recently quite substantially – it seems obvious that in some instances the distribution economy to have a positive impact on the labour market and this should not be neglected. Still, the ecological footprint of global sourcing even for everyday products can be quite hefty, particularly once it is taken in absolute numbers. So the question remains whether there is such thing as “sustainable distribution” at an overall level of assessment, and whether this can bring a solid, long-term future to the related places that are further specialising as hubs. MacGregor, J. & Vorley, B. (2007). "Fair Miles": The Concept of "Food Miles" Through a Sustainable Development Lens. International Institute for Environment and Development (IIED). Watkiss, P., Schmith, A., Tweddle, G. & McKinnon, A. (2005). The validity of food miles as an indicator of sustainable development. Final report prepared by AEA Technology Environment for DEFRA, London.